Chinese gamer and Saint Seiya superfan, Le Shui (not his real name), recently finished one of his life's goals, to travel like the Saints in Saint Seiya to the Sanctuary of Saints in Greece. 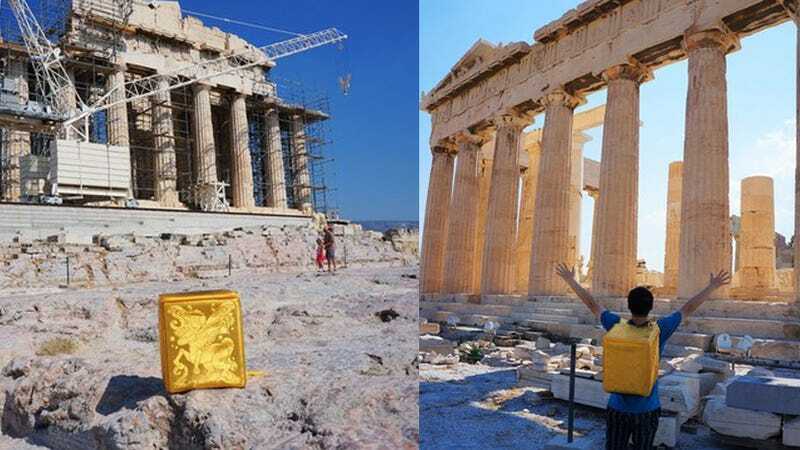 However unlike normal fans who traverse to the ancient temple in Greece, Le Shui bought with him a piece of swag from the recent China Joy to make his trek more "realistic", a backpack in the shape of a Gold Cloth. Saint Seiya, for those that don't know, is a Japanese animated cartoon and comic book series about a group of saints that fight for the Greek Goddess Athena. In the series, each saint wears a special armor called "cloths". The power of the cloths are denoted by its color, the strongest being the Gold Cloths. Saint Seiya was and is very popular among the post 80s and 90s generation of Chinese. During this year's ChinaJoy game expo, one of the most coveted piece of swag was a backpack that looks like the gold cloth in Saint Seiya. Unfortunately Kotaku wasn't able to attain one. The backpack was given out as a promotional material for the Saint Seiya Online game in China. Taking his awesome piece of swag with him to Greece, Le Shui set out to recreate scenes from his favorite cartoon. Taking odd looks from tourists and locals, Le Shui touched down in Greece earlier this month and made his way to the Parthenon to pay homage to the classic series. Mirroring a quote from the series, Le Shui posted on his Sina Weibo account his feelings about the trip. "Dreams are not impossible, when a person gives up on their dreams they give up on life—regardless of how others ridicule you for your dreams you must fight on," wrote Le Shui. "Let the cosmos burn in 2012."